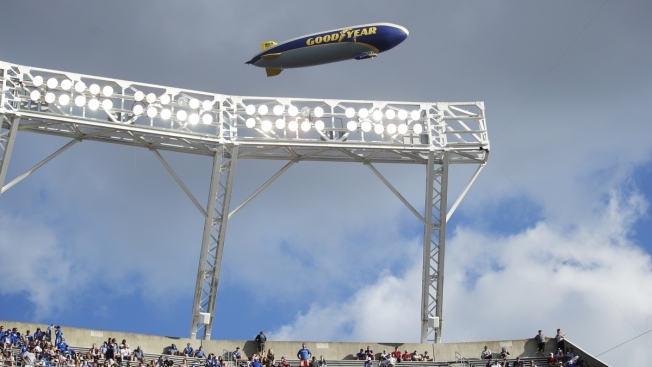 This Jan. 1, 2019, file photo shows the Goodyear Blimp during the VRBO Citrus Bowl between the Kentucky Wildcats and Penn State Nittany Lions at Camping World Stadium in Orlando, Florida. As a nod to its influence and legacy to the game, the iconic airship is being inducted into the College Football Hall of Fame as an honorary member — the first non-player or coach to be inducted. One of the new college football Hall of Famers has an inflated ego — and more. The Goodyear Blimp, which has become a staple at major sports events for more than 60 years, is being inducted into the College Football Hall of Fame as an honorary member — the first nonplayer or coach to be inducted. As a nod to its influence and legacy to the game, the iconic airship joins a stellar class that will be enshrined at the National Football Foundation's award banquet in December. The blimp will soar into the hall along with Texas quarterback Vince Young, Notre Dame speedster Raghib Ismail, Arkansas running back Darren McFadden, Oklahoma defensive back Rickey Dixon, John Carroll linebacker London Fletcher, Texas A&M defensive lineman Jacob Green, North Carolina State receiver Torry Holt, Arizona State quarterback Jake Plummer, USC defensive back Troy Polamalu, Wisconsin offensive tackle Joe Thomas, Michigan State running back Lorenzo White and Mississippi linebacker Patrick Willis. Dennis Erickson, who coached Miami to two national championships, and Joe Taylor, who won 233 games at historically black colleges, were also selected for induction. The blimp's flight to fame began during the telecast for the 1955 Rose Bowl Game and has led to its unmistakable attendance at over 2,000 games, hovering above stadiums from coast to coast. "College players and fans know that when the Goodyear Blimp shows up, it's a big game," said Archie Manning, National Football Foundation chairman. "Its presence is intrinsically known and tied to the traditions that make college football so great." The Goodyear Blimp was the first to provide aerial coverage of a major sports event and first to deliver high definition live video to a national game. ESPN analyst Kirk Herbstreit, who played quarterback at Ohio State, said seeing the blimp overhead signified reward. "I've been lucky enough to both play and broadcast underneath the shadow of one of sports' biggest icons, and each time it's special," Herbstreit said. "For me, playing under the blimp felt like a payoff for the hard work that goes into game day, so I'm excited it's getting recognized for its contributions to college football."